Mike Smith’s first All-Star appearance included a laid-back skate with his kids, a Hollywood-inspired goalie mask, and a have-to-see-it-to-believe-it moment during the skills competition. Yes, one of hockey’s most competitive stars can enjoy a little fun and games every now and again. The strapping 6-foot-4, 215-pound backstopper from Kingston, Ontario seemed to be wearing a perpetual smile throughout the recent All-Star Game festivities in Los Angeles. He certainly had plenty of reason to. Not only did Smith enjoy a private skate of sorts when he and his three young ones spent some time on the Staples Center ice by themselves on an early Saturday morning, he also brought some artistic flair to the annual gathering of NHL greats with his colourful mask - which included Elsa from the hit movie Frozen and cartoon legend Wile E. Coyote. Mike Smith's #HockeyGoesHollywood mask is straight 🔥. Recognize some familiar faces? Smith’s family also made it on to the mask, as did “Smittywood,” which was painted on the back. 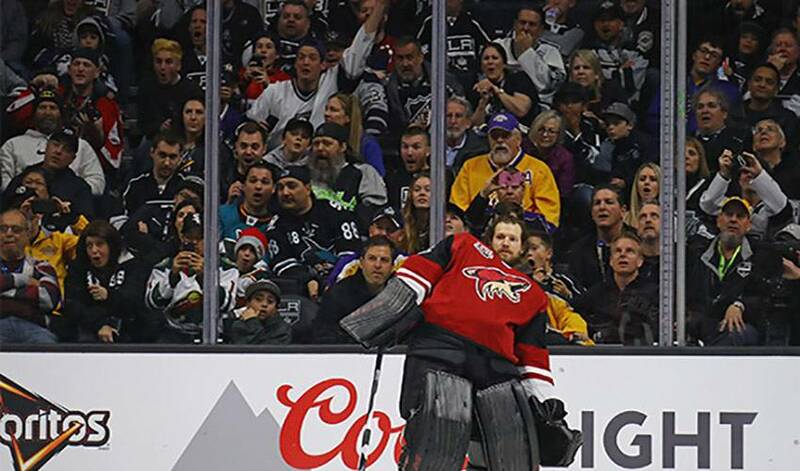 The day before the 62nd All-Star Game, the Arizona netminder managed to steal the show during the skills portion of All-Star weekend when he scored a 200-foot goal in the Four Line Challenge. Smith showed off his eagle-eyed accuracy by firing the puck into a tiny target. It earned Smith plenty of fist bumps and hugs - plus a big 20 points – as his Pacific Division side took the Four Line Challenge. It wasn’t the first time the 34-year-old netted a long distance beauty. On October 19, 2013, Smith scored into an empty cage in a game against the Detroit Red Wings. His Coyotes teammates were thrilled to see the man closing in on 200 career wins get a chance to have some time in the spotlight. It’s been a tough campaign for Smith and co. The Coyotes, who haven’t made the playoffs since 2011-12, are in position to miss out on the post-season for the fifth straight campaign. Even so, Smith won’t stop pushing himself or his teammates until they’ve played their final game of 2016-17. For Goligoski, who signed a five-year contract with Arizona on June 22, 2016, it’s just the type of professionalism he’s come to expect from the goaltender that has two gold medals for Team Canada (2014 Winter Olympics and 2015 World Championships). And as he showed throughout All-Star Weekend, Smith can also go a little Hollywood – in the best possible way – every now and again.